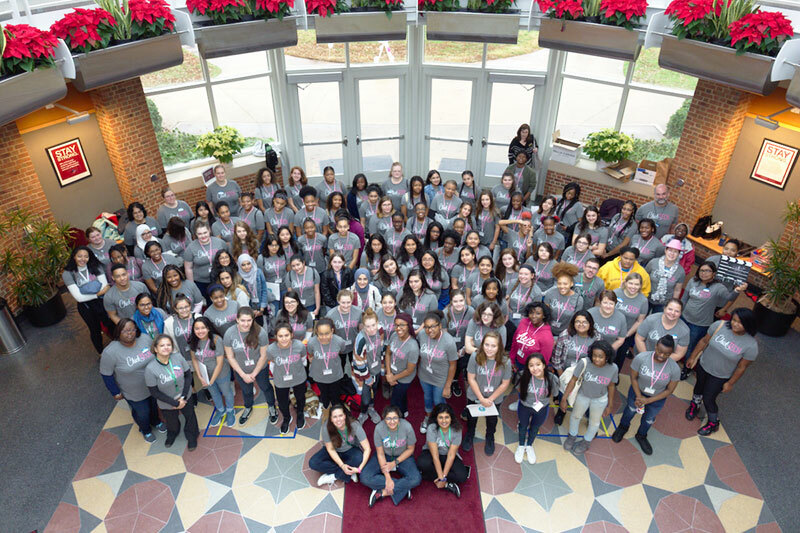 Ninety-one high school girls from Wake, Durham, and Orange counties spent the first weekend of December on Meredith’s campus building and racing robots, creating Android apps, filming videos, tinkering with Raspberry Pi mini-computers, and learning about 3D printing. These young women were participants in ChickTech Raleigh-Durham’s two-day, hands-on workshop for high school girls. The annual event, in its second year, is held to encourage high school girls to enter computing and technical fields. Meredith College’s School of Natural and Mathematical Sciences was one of the sponsors of the event, along with corporate sponsors such as Red Hat, NetApp, Fidelity Investments, and ARA. 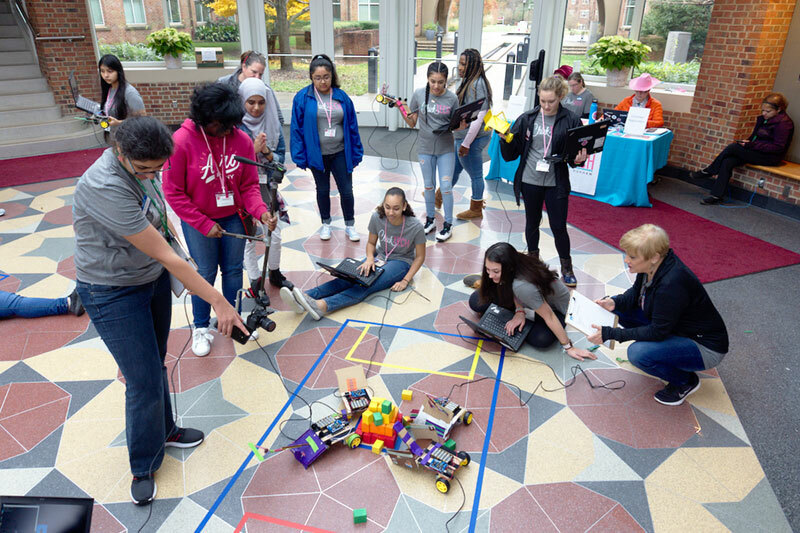 “Having these young women and their families on our campus, using our facilities, and seeing how committed we are to teaching STEM communicates a message to the broader community that Meredith is a force in STEM,” she added. Meredith President Jo Allen, ’80, served as a keynote speaker for the workshop — a role she agreed to take on because she was inspired by the girls who participated in ChickTech. “Their intellect and their fascination with technology suggests a counter-argument defying stereotypes about what girls are interested in—and what they are good at doing,” Allen said. “We know that girls are collaborative, communicative problem-solvers. It’s exciting to see how they approach both new and lasting puzzles and how they think through the nooks and crannies of the problems and potential solutions." In her introduction of Allen, Wolfinger noted how appropriate it was for Meredith's president to deliver a message to ChickTech participants. Allen’s message to ChickTech participants was one of empowerment, encouraging the young women to use their strengths, to work together, and to be resilient when faced with challenges. She also emphasized the importance of taking risks and failing. Following Allen’s opening address on Sunday morning, participants finished projects started the day before, and displayed them for their families and sponsors in a closing event. Founded in Portland in 2013, ChickTech is a non-profit organization dedicated to encouraging more women to enter high-tech fields. Chick Tech Raleigh-Durham was founded in 2016.